World Snooker Championship Day 9: Ronnie O'Sullivan played his best snooker to go 11-5 up on Mark Williams, requiring two more frames to play Robertson in the final eight. The Rocket had a 5-3 lead on Mark Williams overnight. Williams had chance to win the first frame of the session but his mistakes put himself into the trouble. Ronnie had a blinking start of 107. He went on to take the following three frames before mid interval, with runs of 74, 51 and 68 to be 9-3 ahead of The Welshman. The mini break did not cool The Rocket's hands. 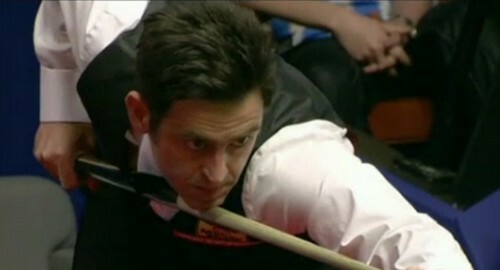 A dominating O'Sullivan played his best snooker to make it 11-3, with a marvellous break of 128 and a nearly century 93. The three-time World Champion could have a session to spare if he won the next two frames. Credits must be given to Mark Williams, who made 86 after losing nine frames in a row to guarantee the match would go to the final session. Williams took the final frame of session as well to trail 5-11 behind O'Sullivan. 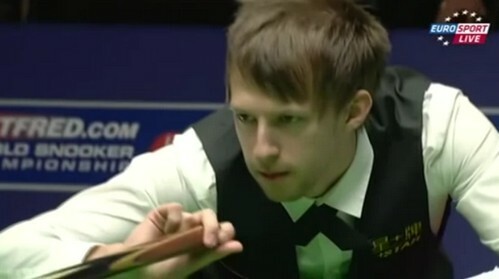 Last year's finalist Judd Trump found his way today to lead Ali Carter by 9-7 from 3-5 down. Unlike O'Sullivan v Williams match, there are more safety exchange but still a high-quality match to be watched. Trump won the opening frame with 120 to narrow the gap but The Captain missed the frame ball pink to regain two-frame advantage in the next frame. Nevertheless, Carter made 112 before Trump levelled off at mid interval. Trump won the next two frames to go 8-6 up before Carter pulled one back with 54. Trump could not be stopped by Carter, 79 in the final frame of the session guaranteed himself to lead 9-7 overnight. Crucible Debutant Jamie Jones is 10-6 ahead of Andrew Higginson, setting to reach the quarter-finals by winning three more frames tomorrow. Matthew Stevens and Barry Hawkins all squared at 8-8 after two sessions.